A basketball team goes as far as its point guard can take it. Massachusetts men’s basketball coach Derek Kellogg should know that as well as anyone. 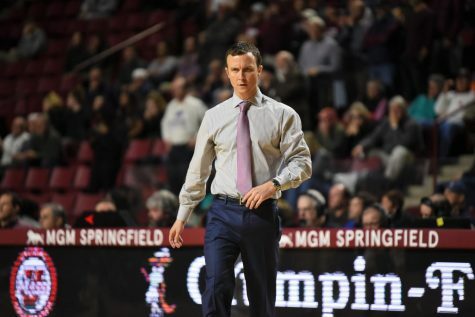 After all, he did serve as the Minutemen’s floor general in the early ’90s, calling out the signals during the most glorious days of the program when the team was consistently under the national spotlight. 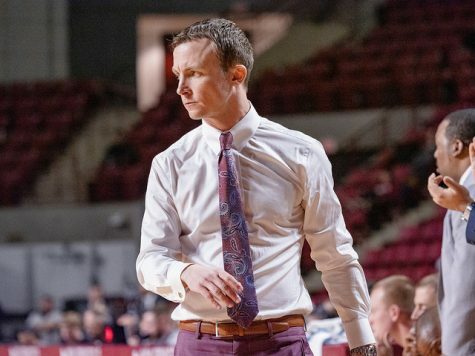 Now, nearly 20 years since last donning the Maroon and White for UMass, Kellogg is entering his fourth season patrolling the sidelines as the coach for the Minutemen. While the team’s makeup has surely changed over the years, the need for consistent guard play hasn’t. After a couple of seasons without reliable play at point guard, Kellogg finally has reason to believe that will change this season. Standing at 5-foot-9 and 175 pounds, Chaz Williams certainly isn’t the easiest to spot, especially when you factor in his lightning quick pace that can help him get by defenders in almost the blink of an eye. And with his small stature, the first-year point guard has big shoes to fill this season. 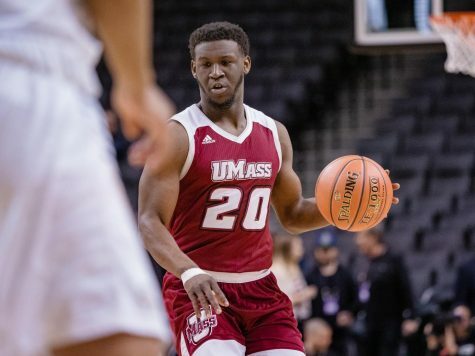 After sitting out last year due to NCAA transfer regulations following his switch from Hofstra, Williams will make his debut for the Minutemen in the season opener tomorrow night at the Cage as the starting point guard. While this will technically be his first year on the team, Williams has had the benefit of a full year of practicing and getting acclimated with his teammates. After an impressive performance in the preseason, Kellogg has full confidence in handing him the keys to the offense. Those expectations are warranted too, partly because he has done it before. As a freshman at Hofstra two years ago, Williams averaged 9.8 points and 2.8 assists per game on his way to being named to the Colonial Athletic Association All-Freshman Team. He’s also a threat to drain the 3-pointer, as he averaged 38.9 percent from beyond the arc that season. 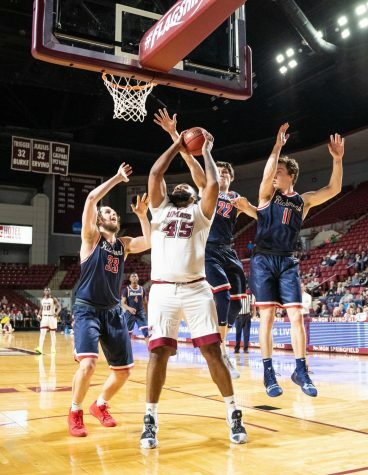 After a year off and watching from the sidelines, Williams is eager to get back on the court and be an integral part of the Minutemen’s plans for success this season. “I expect to do some things I haven’t gotten to do in the past,” said Williams. “A lot of things that will make my teammates better and a lot of things that’ll help us win games. 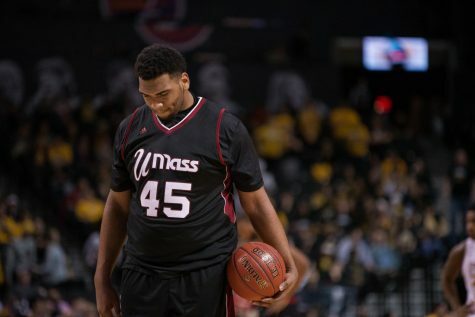 “I want to help bring some excitement back to UMass,” he added. 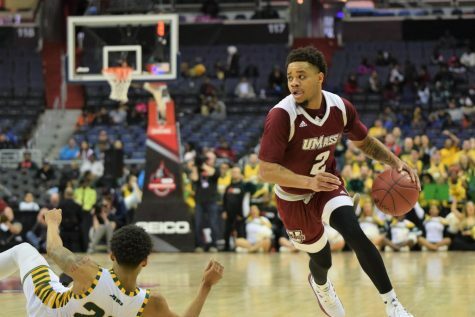 Excitement will be a key ingredient to the UMass recipe this season, as Kellogg has designed a new offensive system that will cater to Williams’ abilities. 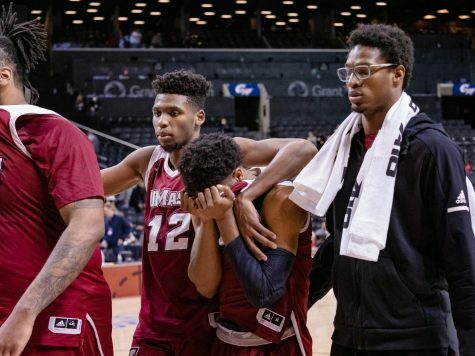 After losing Anthony Gurley to graduation, the Minutemen will be abandoning the dribble-drive offensive style that has been its staple over recent years. While the offense geared towards Gurley’s ability to create his own shot, the scheme got stale quickly, Kellogg explained. Without any other players that could create their own shot, defenses were able to key in on Gurley and force turnovers and a difficult shot selection. 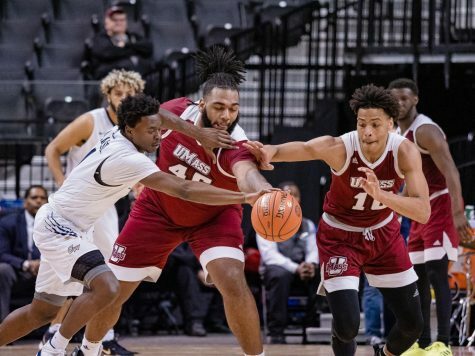 But now, as UMass moves on from the Gurley era, a new fast-paced, run-and-gun offensive style will be installed and Williams is seemingly licking his chops in anticipation of leading this new brand of Minutemen basketball. Williams’ job is made a lot easier because the roster is deep with athletic wingers that can get on the break with him with ease. 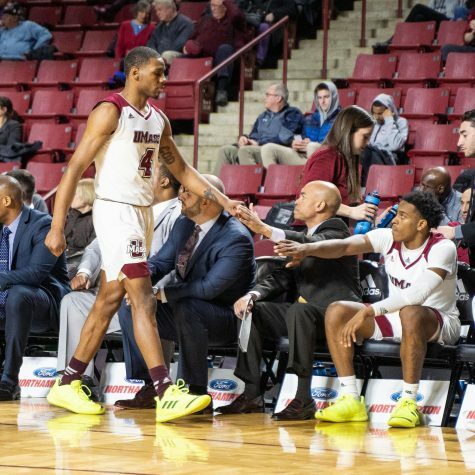 Players like Freddie Riley, Javorn Farrell and even senior center Sean Carter are some of those beneficiaries that are pleasantly welcoming the game that Williams will bring to the table this season. “He’s a point guard that’s done it before,” he said. 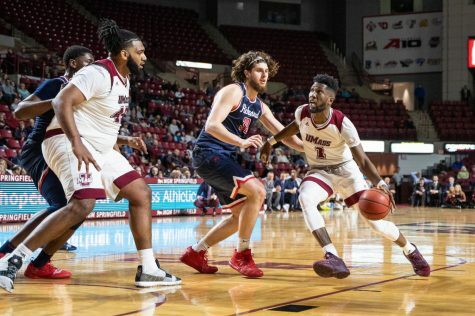 “It’s not like, ‘Can he do it?’ or ‘Will he do it?’ because he was an All-Freshman player in the CAA, which is a league almost comparable to the Atlantic 10. For now, as he settles in with his team in anticipation of Friday night’s opening tip, Williams is focused as much as ever on the task at hand. He says that he doesn’t feel the pressure of being the starting point guard and that as a Brooklyn native, he’s ready for anything. “At the end of the day, it’s just basketball,” he said. “It’s something that I love to do.